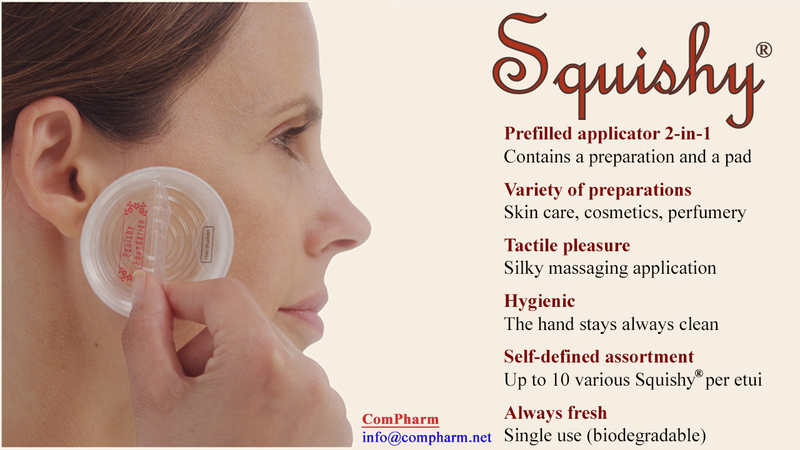 Squishy® is a worldwide patented compact massaging disposable biodegradable applicator prefilled with a broad variety of skincare, cosmetics, and perfumery. Hundreds of conventional products can be packaged in Squishy® for a convenient, hygienic, and pleasurable use away from home or on the go. A perfect match of the ready and easy to use Squishy® with demands of mobile modern people, the tactile pleasure applying Squishy®, self-defined assortments of Squishy® etuis (cases), a highly hygienic use, and better results clearly differentiate Squishy® from all existing products. Squishy® contains a capsule of a liquid preparation, a soft pad, and a convenient grip. When the user presses on the applicator, the capsule opens and releases the liquid that gradually infuses the pad. The user grasps the grip and can immediately, conveniently, and hygienically apply the preparation on the skin. The hand does not touch the pad and remains clean. Squishy® should be used once, immediately after opening. Squishy® can contain hundreds of various skin care and cosmetic products, almost all those that are produced today in conventional packages. You will see some examples below. Only a few cosmetic products (such as mascara or lipstick) are not suitable for being applied with Squishy®. However, they can be easily removed with Squishy®! Are the existing solutions not sufficient? Touching the face with dirty hands (frankly, the hands are not always clean on the go) to apply a skincare product from a travel package is not hygienic. Reusable travel packages can also get contaminated and spoil. The other way round, a skincare product dirties (oils) the hands that need to be washed, which may be problematic on the go. 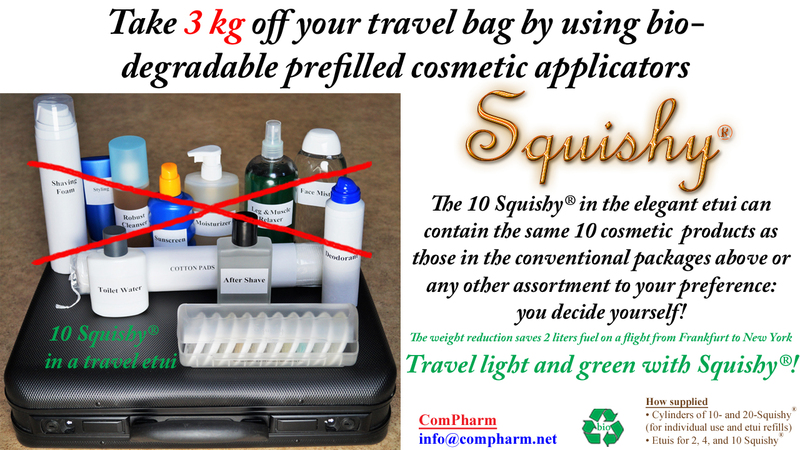 There is no special solution for orderly carrying skincare and cosmetic products, particularly, in voluminous packages. Usually, people put them directly into a travel bag or a clear plastic bag for a pre-flight clearance. The assortment of skincare on the go is often limited to a few travel packages or wet wipes. One should also abide by air travel regulations and bring on board ordinarily no more than 1 liter of liquids, which limits the variety of conventionally packaged products. Wet wipes that roll up upon rubbing the skin or travel packages that leak offer little comfort. The tiny liquid volume of wet wipes is not sufficient for body care, such as sunscreen or moisturizing. 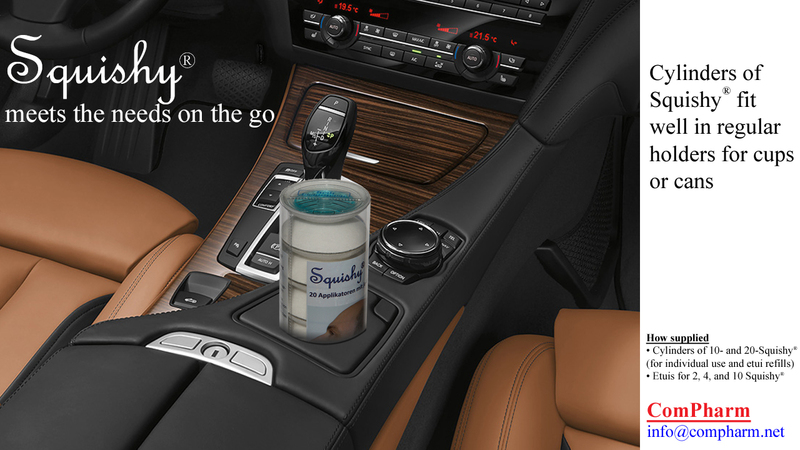 With the compact, 2-in-1 (containing a liquid preparation and a pad), ready and easy to use applicator Squishy®, you can use hundreds of skincare and cosmetic products conveniently, regularly, and in a sufficient volume in your car, on a trip, at work, etc. Squishy® eliminates the contact of the hand with a skincare or cosmetic preparation: the treated skin (e.g., the face) remains untouched by possibly dirty hands on the go. Also, the hand stays clean from the preparation. The single-use packaging of Squishy® safeguards against contamination and spoiling of the preparation. You can refill the 2-, 4-, or 10-Squishy® on-the-go etuis to your preference. The product label is well seen through the clear lid of the etui to help you maintain the desired assortment of Squishy®. A pleasurable massage with the silky curved Squishy® brings a sustained relief to your skin. Gently massaging with Squishy® results in an even spread and a better penetration of a skincare preparation without using it to excess. Rubbing your own sweat into the skin with a deo roll-on or a deo stick is absolutely not hygienic! A useless spraying of a deo spray in the air is at least not smart. Squishy® Deodorant and Armpit Cleaning Lotion carefully remove the sweat and leave active ingredients on the skin. As distinct from wet wipes (and all sorts of moisturized tissues, towels, and the like), Squishy® can contain 10 to 15 ml liquid for body care. With Squishy® Sunscreen, for example, you will be no longer leaving oily fingerprints on your mobile phone or glasses or spraying the sunscreen mostly in the air. The 10-ml Squishy® fits into the regular 10-Squishy® etui. In addition, Squishy® makes a body application a pleasurable experience! Anti-acne, anti-alopecia, antiseptics, and cleansers can be applied on a normal or an affected skin with the single-use Squishy® more conveniently and hygienically than with multiple-use ball-type applicators or wet wipes and cotton pads. With Squishy®, the user’s hands stay always free from cosmeceuticals, skin sebum or exudate. How many benefit-points would you ascribe to Squishy®? Cosmetic wet wipes (moisturized tissues) and travel packages of conventional products (small bottles or tubes) are alternatives to Squishy® in the on-the-go segment of the skincare and cosmetic market. You decide on your favorite! The chic design of Squishy® matches its super-innovative technological level and makes Squishy® a top-trend object among youngest customers. There is no limit for the variety of Squishy® products for a party! Wherever you are - at work, in your car, in public transport, elevator, while shopping, on vacation, etc. - the diversity of convenient, functional, hygienic, and enjoyable Squishy® will enhance your life and feelings! Not only Squishy® and its on-the-go etuis are well suited for your travel. 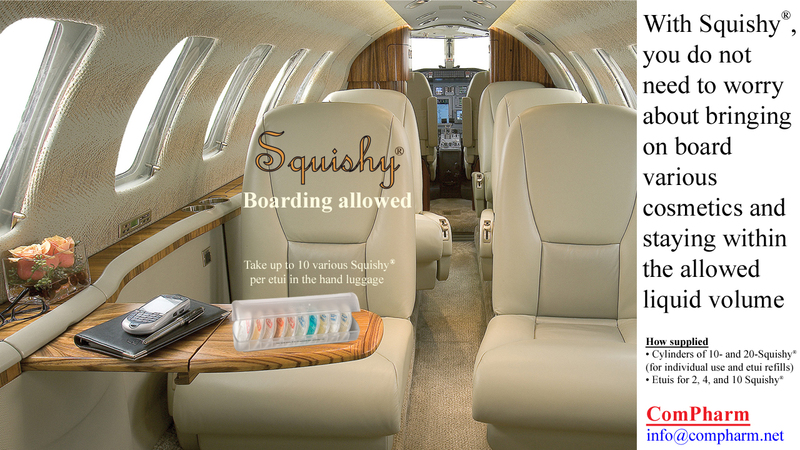 Take on board with Squishy® as many various skincare and cosmetic products as you need. In most instances, the volume of Squishy® is 4 ml: a 10-Squishy® etui would contain only 40 ml of liquids, which is far below the allowed liquid volume to be brought on board of a plane. How can you purchase Squishy®? You will be able to purchase Squishy® in place-saving 10- or 20-Squishy® cylinders and use them one by one for up to 10 or 20 applications (in your bathroom, bedroom, car etc.) or for a refill of 2-, 4-, or 10-Squishy® on-the-go etuis in the assortment that you define on your own. Through the transparent etui lid you can clearly see product labels on individual Squishy® and maintain your desired assortment. The excellent suitability and functionality of Squishy® on-the-go, self-defined assortment of portable etuis, hygienic and pleasurable applications, and better cosmetic results clearly differentiate Squishy® from all existing products for mobile consumers. 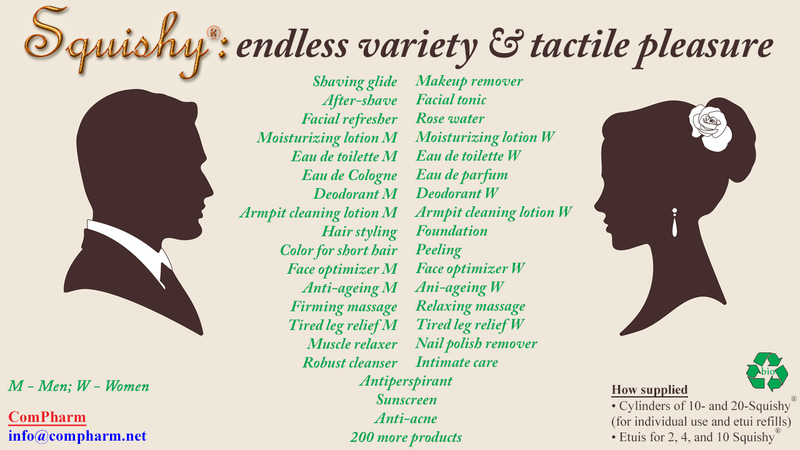 Hundreds of face care, body care, cosmetic products, and perfumery can be offered in Squishy® to meet diverse needs of modern people on the go as well as those of demanding connoisseurs. The chic design of Squishy® that matches its highly innovative technological level is poised to make Squishy® a top-trendy and status-defining object, particularly, among younger customers. Skin type and cosmetic selection / utilization analyses based on photos of used Squishy® and the face captured by customers on mobile phones and Squishy® Pleasuremeter would be offered as a free online service. Squishy® as a unit-dose prefilled disposable massaging applicator can be advantageously used for external medications. Squishy® is very easy to use and highly hygienic: it requires no gloves or washing the hands after applying a medication by the patient or caregiver. Compared with conventional medications in tubes for a finger rub, Squishy® makes applications more effective, pleasurable, and convenient both at home and on the go, which should improve the patient’s willingness to use a medication and treatment compliance. Squishy® is going to be developed for human (such as anti-inflammatory, antithrombotic, antimicrobial, therapeutic irritants) and veterinary (such as anti-infective, antiparasitic) indications. Squishy® will be supplied sterile with the pad covered by a protective cap. Applicators that are built on the same patented technology and possess the same unique benefits but look differently as Squishy® are envisaged for household applications, such as shoe care and polish, insect and rodent repellant, indoor and auto scent, dirt, stain, and lime remover. Squishy® can contain reagents for visual color tests upon contact of the pad with blood, illegal substances, poisons, or gunshot residues. Wiping an examined surface with Squishy® can enrich the pad with sought substances and increase the probability of positive findings. Squishy® eliminates the contact of harmful reagents with the investigator’s hands or clothes. A spectrophotometric characterization and other detection tests (enzymatic, immunological) are possible. Squishy® is a single-use applicator produced mostly (95%) of biodegradable materials and should be disposed of at best as a biowaste. Great thanks to all those who have contributed to the development of Squishy® or otherwise, directly or indirectly, supported this project!